• Teach children to think about their behaviour and to learn self- control. • Give children the chance to make decisions about their work and play so they can learn about responsibility and independence. • Teach children to be polite and fair. • Teach children to respect other people, their property, beliefs and feelings, essentially, to respect difference. • Praise and reward good work, behaviour and attitudes. • Involve parents in all aspects of school life, including their children’s behaviour. 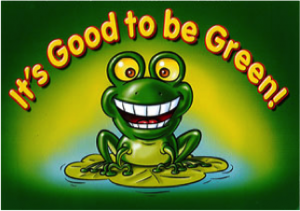 We have adopted the ‘It’s Good to be Green’ behaviour system in school. This includes charts, stickers and rewards for good behaviour. Since introducing this system, we have seen a noticeable improvement on behaviour in and around school. I like schools because when you get upset, your friends ask you to come and play with them.